Timmy Brown is Off to Nashville! The big day has arrived. Today, October 16th 2018, is moving day for one of our favorite local country artists, Timmy Brown. The Norton, MA native has loaded up his U-Haul truck with his treasured Gibson hummingbird and is currently making the one-thousand-mile drive to sunny Nashville, TN. Music City is gaining a talented songwriter, accomplished guitarist, and brilliant entertainer. Timmy Brown has made country music his life. He learned to play the piano at the age of five and later he taught himself to play the guitar. Brown is a classically trained singer and his voice is incredible. Over the years, Brown has auditioned for The Voice, America’s Got Talent, and not one, but two seasons of American Idol. This past year he made it all the way to the Top 60 on American Idol! 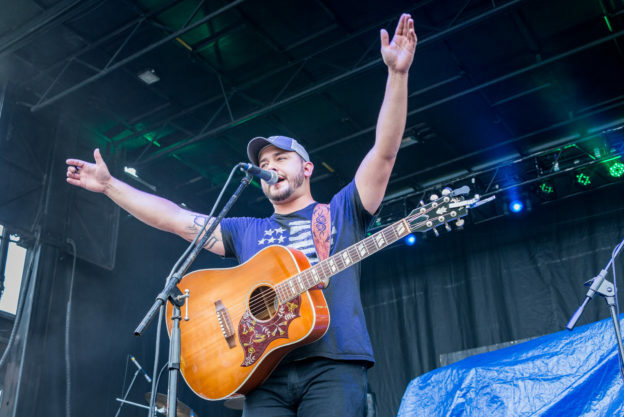 Timmy Brown has opened for stars such as Kane Brown, Dustin Lynch, Lindsay Ell, Chase Rice, High Valley, and Jimmie Allen. He is the winner of our New England Country Music’s Local Male Artist of the Year award for both 2016 and 2017. He also performed at our annual NECM Festival in both 2017 and 2018. An avid New England sports fan, Brown has had the opportunity to sing the national anthem twice at Gillette Stadium before Patriots’ pre-season games. Timmy Brown has been performing all over New England both acoustically as well as with his four-member band, Black Diamond Country Band. Black Diamond has been regularly playing at Toby Keith’s I love This Bar and Grill in Foxborough, Greasy Luck Brewpub in New Bedford, as well as local fairs and festivals throughout the area. The talented members include Mike Franklin on lead guitar, David Allen on bass guitar, Jeff Ballou on drums, and Leo Melanson on steel guitar and guitar. Timmy Brown released his first EP, ‘Leave This Town,’ in April of 2016. It was recorded at Sound Emporium and Blackbird Studio in Nashville. The six-song album is filled with a mix of emotionally charged tracks such as ‘Fly Away’ and fun-loving country tunes like ‘Lil Bit’ and ‘Tequila, Lime, and Salt.’ He has been performing a combination of covers and these six songs over the past two years to his loyal fanbase all over New England. Recently, Brown has introduced us to two brand new songs that he wrote but has not recorded yet, ‘How We Drink Here’ and ‘That’s Where You Come In.’ Last month, at the second annual Local CountryFest at Indian Ranch, before introducing the crowd to his song ‘How We Drink Here,’ he said: “How many of you guys have ever gone out on a Thursday night or a Friday night after a long week and you told your friends you were just gonna have one drink. But one turns to two and two turns to three, right? That’s what I wrote this song about. Cause that’s how we drink in New England.” Later in the performance he explained the meaning behind ‘That’s Where You Come In,’ by saying: “How many of you have a dream or don’t have a boyfriend or girlfriend, or have something that you’re working on? You have this dream and you have this life and you want to share it with someone. That’s what I wrote this song about.” Both of these songs will make fantastic additions to a future album. Though we are very sad to see Timmy Brown leave us New Englanders, he does plan on returning for shows. Be sure to check his schedule. We, at New England Country Music, wish him all the best on his new adventure! Be sure to purchase his debut single ‘Lil Bit’ on iTunes here. You can keep up to date Timmy Brown’s journey by following his website, Facebook, Instagram, and Twitter pages. This entry was posted in Home page blog and tagged Ain't Gonna Lie, Amen, Fly Away, Leave This Town, Lil Bit, Nashville, Tequila Lime and Salt, Timmy Brown on October 16, 2018 by BeckyNECM.